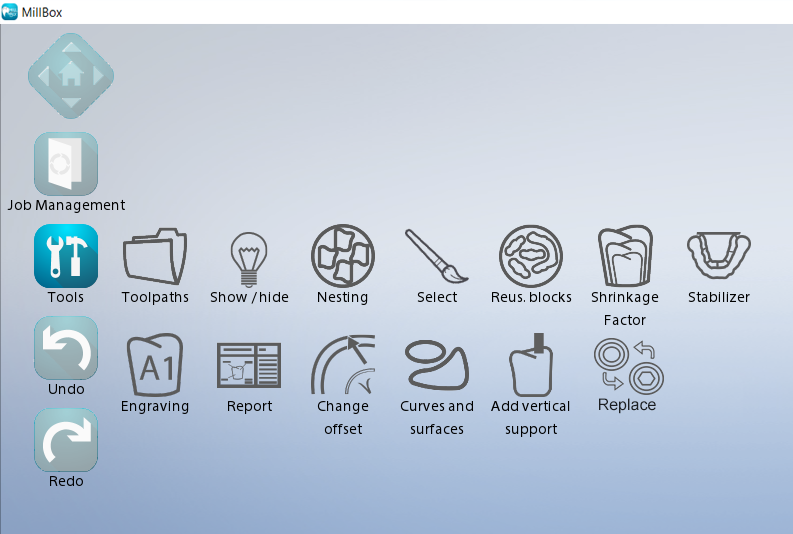 Equipped with a simple to follow user interface that is both innovative and appealing, MillBox simplifies the nesting and toolpath creation. An Interface specifically developed for immediate use, with exciting new featuresthat allow you to work even faster. Specially designed for professionals who require simple and reliable tools. MillBox provides high performance in less time to get the work you want processed in a few simple steps. The constant development of MillBox allows the continuous release of new features and improvements, realized working side-by-side with customers themselves in order to customize their specific requests and best meet their needs. detection , offset, orientation, etc. 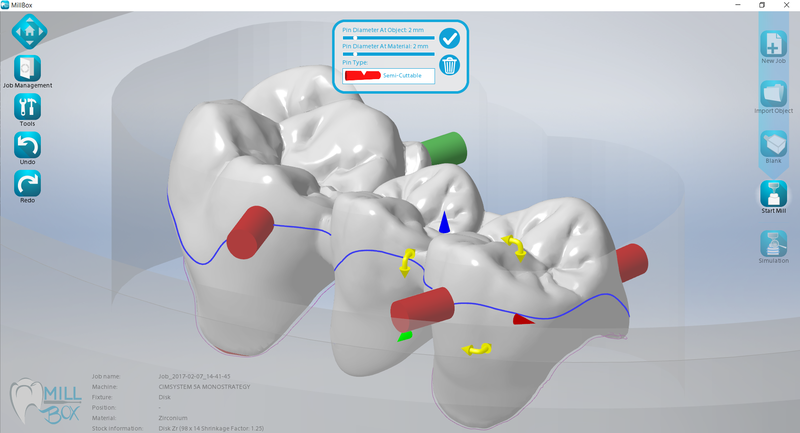 ), as well as the optimized positioning in relation to the machine used. the support pin. 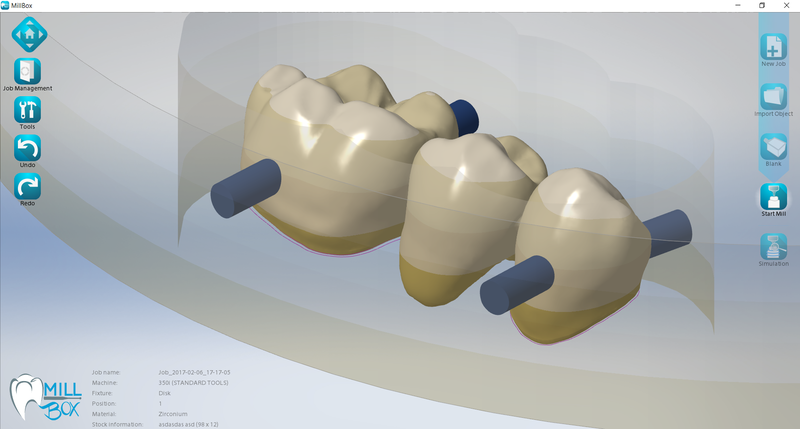 MillBox highlights the emergence of a possible undercut when a connector is inserted or relocated. 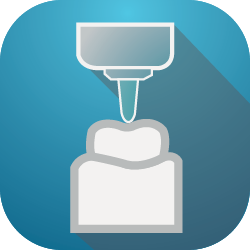 All of the materials that are currently being used in the dental industry are supported by MillBox. This includes the possibility to view the color of the material in use and their gradient in relation to the restoration. We can utilize and create “shaded” and “multilayered” materials with which the user can enter and move the element to the most appropriate position, thanks to the display of different colors within the defined stock. 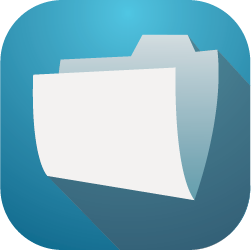 In MillBox the new and used disks management is very intuitive. When all the elements to be milled are inserted, the selection of discs opens up. We can create a new disk to use, or select a previously used stock. 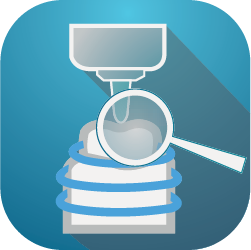 The stock library, which includes disks, blocks, cylinders and premilled, is completely open, offering the user the opportunity to expand it. The raw partially used stock is automatically saved in the library allowing it to be reused. In MillBox, different editing and control tools have been included. Among them: the analysis of the object, changing the margin line, recognition of the axes and holes, summary reports, and the reuse of previously used raw materials based on an image or file coming from different systems, selection of areas of work for specific operations, incisions and creation of closures over the holes to avoid unnecessary work in those areas. 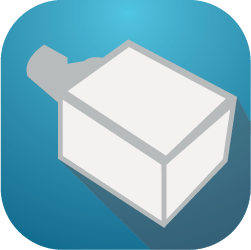 In MillBox you can handle up to 5 different types of bridge stabilizers, each with its own structure that adapts to the type of object requiring support. It is possible to define the use of the types of stabilizers in relation to the type of element, or decide to use only one type for all elements. The same configuration can also be made according to the material you are using. If the Fit does not fulfill the technician’s requirements, you can change it with a click by selecting the best match to the working element, all without changing any kind of strategy. Then you can set as default the parameters used to automatically apply whenever you import a similar item. The creation of custom reports and print-outsfacilitate the organization and management of jobs, thus avoiding production and shipping mistakes. A wide range of report variables can be managed in order to allow the automatic population of data for printing information on the run, the machine, the type & size of material and milling time. All the Tools Using Just One Click! The MillBox workflow begins with the creation of a new project. In this phase the user will find the machine to select among those configured, the material on which the machining will be performed and at last the fixture. 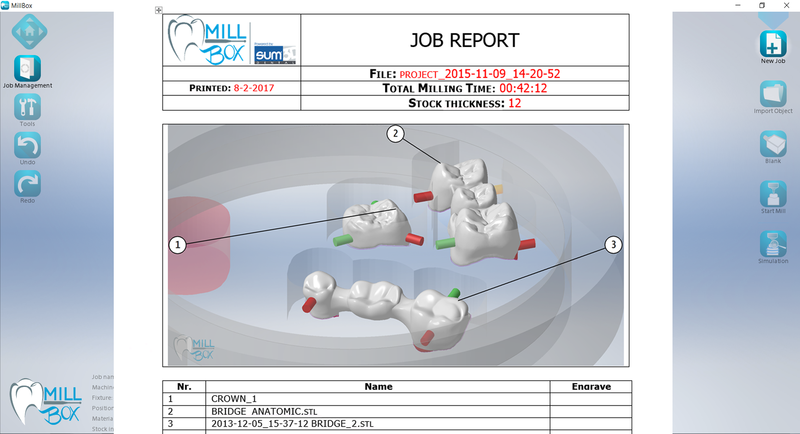 This sequence allows MillBox to prepare the phases of the process, as all information related only to the choices made are loaded, without encumbering the calculations. 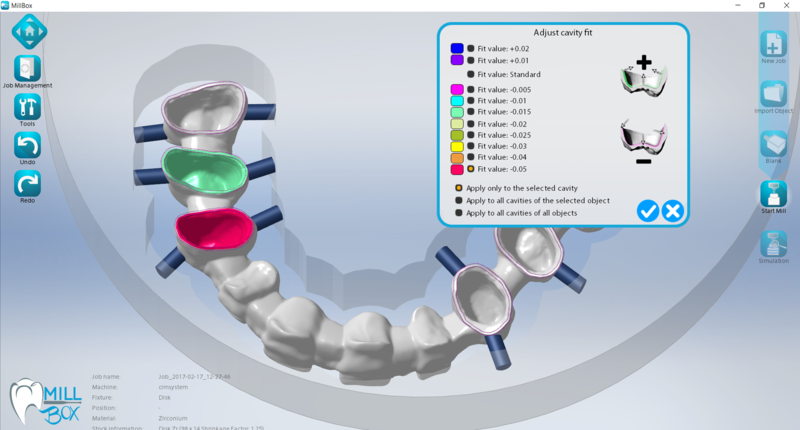 The following step is to choose the type of object to be worked: bridge, crown, implant, bar, abutments etc. 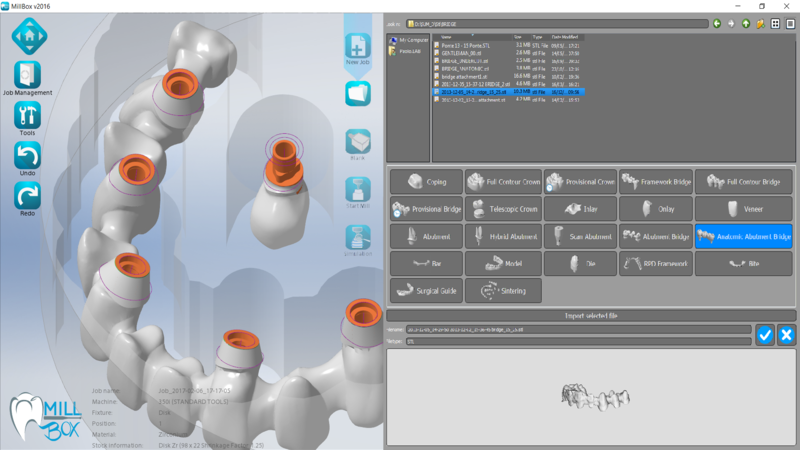 are shown with a preview that allows the user to view the element you are selecting to mill. 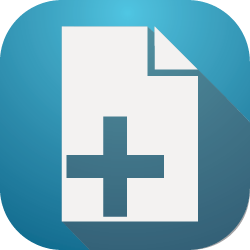 The object types available are dependent on the material selected. 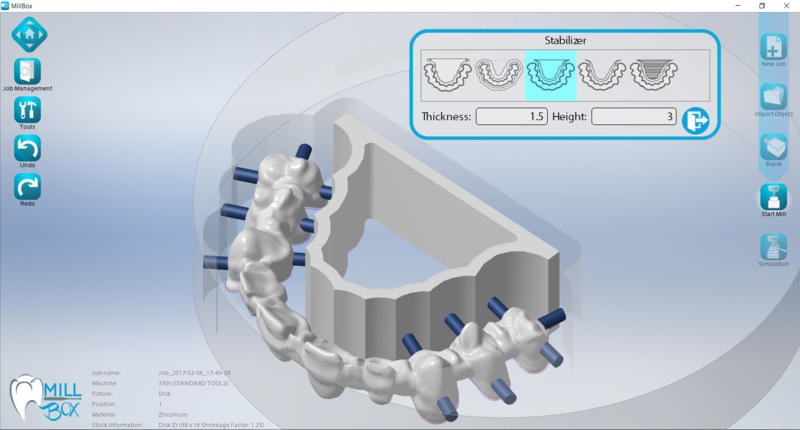 Each individual element is analyzed in order to reduce the undercuts, verify their height, the axis of the holes, and the recognition of the margins. Once you have chosen the element to mill, the user switches to the selection of stock (new or used). The user is guided in their choice between new or used that fits perfectly to the positioning of the new elements to be machined. 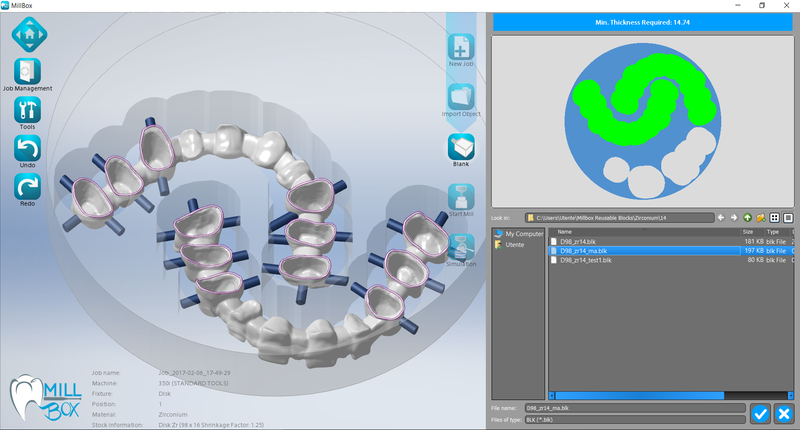 The support connectors are automatically created by MillBox that will show a preview of nesting. The calculation of the tool path can thus begin. At this stage there are two main options: “Start Milling”, in which the machine starts to mill without having to wait until the completion of the calculation; “Save tool path”, where MillBox starts calculating and the CNC file is generated only at the end of calculation. There is a third option, called “Partial execution”, with which you can start or resume the machining from a particular point or stage of the milling. In MillBox, two types of simulation are considered: one takes into account the “zone”, where you can see the finished product and therefore any residual material on the parts not milled; a second simulation of kinematic type, which instead allows the collision control of all the elements in motion. In this case the possible collision paths are automatically removed.